Author: James R. Bruce Lockhart. Series edited by: Herrmann Jungraithmayr, Norbert Cyffer. The present volume is dedicated to Hugh Clapperton’s journals, re-discovered, transcribed and revised by the author. 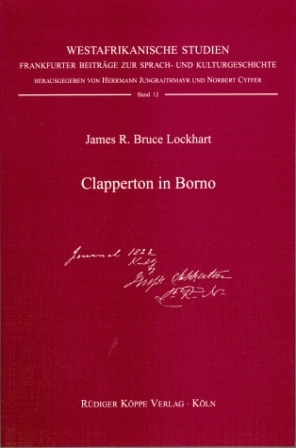 It is not only a simple text edition but contains a comprehensive introduction where the Borno Mission (1822–1825) is described. Furthermore, Lockhart critically deals with Clapperton’s biography. The author successfully combines the original text with comprehensive annotations without ever losing its orthographic and stylistic characteristics. Hugh Clapperton was one of the first British explorers to enter the central Sahara, but his journals were lost for over a hundred and fifty years, and have never been published before. They show him to be one of the most sensitive and sympathetic travellers, his observations untainted by any sense of moral superiority. Hugh Clapperton has a sharp eye for detail, be it wind-stiller magicians, the effect of the evil eye, or slave skeletons round a well-head, and a gift for friendship, whether drinking palm wine with renegades, bantering with local women or delighting in the company of dignified tribal sheikhs. Numerous facsimile reproductions and maps illustrate the text. Jamie Bruce Lockhart (B.A. Cantab, 1963) is a former British diplomat who first took an interest in pre-colonial West Africa when serving in Lagos, Nigeria in the late 1980s. A reading of Captain Hugh Clapperton's Journal of a Second Expedition ..., London, John Murray 1829, led him to follow in the footsteps of the Scottish explorer cross-country from the coast to the desert's edge and from Lake Chad in the East to Borgu in the West. He also identified in detail the route taken by Richard Lander when he sought to return to the sea by way of Opanda and the lower Niger after Clapperton's death in 1827. Bruce Lockhart, who was brought up by the Scottish borders and spent six months as a student on Lake Huron, took an interest in the Scottish traveller's upbringing and early life in the Royal Navy, when Clapperton worked his way up through the ranks to command lake schooners on the Great Lakes at the end of the War of 1812. The author's aim to write a biography, however, was deflected by the discovery in the early 1990s of two previously unpublished diaries of Clapperton's travels in Africa in 1822-1827, one in The National Archives, London and the other in the Brenthurst Library, Johannesburg. These he transcribed and edited or co-edited, with the encouragement and help from several scholars in the field of West African studies, for publication in three volumes between 1996 and 2004. Background studies led Bruce Lockhart to take a wider interest in the pre-colonial history of the region including the central Sahara and Sudan and in particular in the interface between Europeans and the populations of the interior in the first half of the nineteenth century. He is the author of a number of articles on Clapperton's travels and has contributed to the discussion on methods of transcription of 19th-century journals of travel. His biography of Hugh Clapperton appeared in 2007. Ein schönes Buch über Borno im Norden des heutigen Nigeria. Nach verschiedenen Auflagen von Reisebeschreibungen der Expedition von Denham, Clapperton und Oudney nach Borno 1822–25, die zum Großteil aus Denhams Schriften bestehen, liegt mit diesem Buch die Version Clappertons vor. Sie begeistert die Leser mit einer erfrischend unvoreingenommenen persönlichen Wahrnehmung und vielen voher nicht veröffentlicheten Einzelheiten. [...] Ein überaus lesenswertes Buch, das nicht nur an Borno interessierten Afrikanisten – im weitesten Sinne – neue Erkenntnisse vermittelt.